Can LifeLock Still Lock in Profits? No one can deny that LifeLock, Inc., the $1.2 billion company at the forefront of data protection and identity theft solutions, has taken a beating in recent months — crashing over 50% from an all-time high of $22.85 in February to $10.70 by mid-May. The tumble in share price occurred following news that LifeLock was pulling its popular mobile wallet application formed after its acquisition in December 2013 of “mobile wallet innovator” Lemon to comply with Federal Trade Commission regulations. While the stock’s forward momentum preceding the suspension of its LifeLock Wallet service seems to have been all but crushed, has the underlying business model of LifeLock itself changed as a result, and perhaps more crucially, will the company’s core business continue to translate into profits? As of June 2014, nearly 3.4 million subscribers have trusted LifeLock with safeguarding their identity, according to the company’s latest 10Q report. LifeLock offers a triple-tier system to customers, which was revamped at the end of July and currently includes the LifeLock Standard, LifeLock Advantage, and LifeLock Ultimate plans, each more expensive and offering more features than the service before it. LifeLock Ultimate, which had been available as an option before the midsummer product overhaul, has proved to be the company’s most successful service and accounts for “more than 40% [of] our gross new members from December to June 2014”, said the company. Compared to contenders also in the data protection industry — IdentityForce, Identity Guard, Equifax’s TrustedID, ProtectMyID, SmarterPrivacy, and PrivacyGuard, to name a few — LifeLock consistently garners the highest ratings in terms of features offered to users and customer support. The company’s strong fundamentals further solidify a case for investment: revenue has risen year-over-year since 2012, with a “substantial majority” earned through member subscription fees. 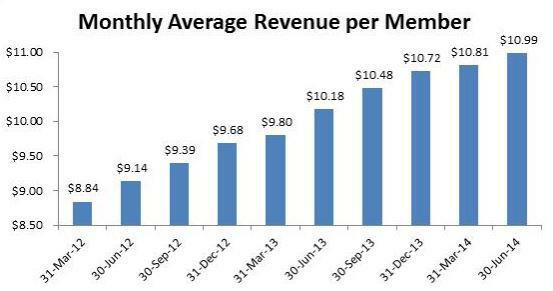 Above: The average monthly revenue per member has consistently grown as a result of increased adoption of LifeLock’s Ultimate service, according to the company’s latest 10-Q report. High customer retention rates, therefore, are a must for LifeLock, and the numbers have not failed to impress. Since March of 2012, the average member retention rate per fiscal quarter stands at 86.74%. LifeLock’s greatest operating expense, advertising, has contributed to a 53.6% increase in the number of subscribers since then. LifeLock’s clients aren’t limited to individuals — well over 200 companies have utilized its services, including “six of the nations’ top ten financial institutions, five of the six leading U.S. wireless providers, and eight of the top ten credit card issuers. Apart from its strong financials, LifeLock’s much-publicized training courses it administers to members of police forces (more seminars are planned for Minnesota, California, and Virginia this year) and future strategic partnerships may do much to further brand recognition and potentially increase member acquisition. Furthermore, increased coverage by major media outlets of data breaches (for example, the recent Russian data theft of over a billion passwords) may spur more viewers to consider an identity protection service, and with LifeLock’s hefty investment in marketing, its brand could very likely be the first name potential customers turn to for safety. As the average cost of member acquisition for LifeLock rises (a 4.6% increase in cost from 2013 to 2014 ), the prices of subscriptions levied onto customers may increase to compensate, negatively affecting customer retention rate. However, retail prices of LifeLock’s services have historically remained “unchanged”, says the company. Additionally, while LifeLock is currently the household name in identity protection services, it runs the risk of being unable to differentiate itself substantially from an abundance of competitors offering too-similar features and pricing. While the corporation’s latest venture into the budding mobile payment industry didn’t pan out as hoped, the consequent sell-off might have been an overreaction by shareholders who haven’t taken into consideration that the company’s core business model remains viable as ever — identity theft, unfortunately, isn’t going to be exterminated anytime soon in an ever-increasingly connected world. It’s imperative to keep in mind that LifeLock’s business centers on analyzing the financial and identifiable footprints left behind by someone (whether it’s you or a doppelganger), not revolutionizing the wallet. Amid an exaggerated sell-off, a history of solid financials, prices near an all-time low, and significant potential for customer growth, there might not be a better time to buy and hold LifeLock for the long haul. Additional disclosure: Not investment advice. I am not an investment adviser. Facts and opinions presented represent my state of knowledge and thinking at the current time. Prospective or actual investors in LOCK may wish to perform their own independent research.